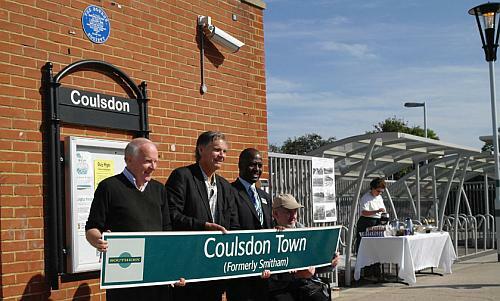 On Sunday 22 May 2011, the Southern railway company renamed Smitham station as Coulsdon Town. This event celebrated the rebuilding of the station as part of the regeneration of Coulsdon town centre . The original Smitham station on the Tattenham Corner line, formerly known as the Chipstead Valley Railway, had opened in 1904 to serve the small village of Smitham Bottom. 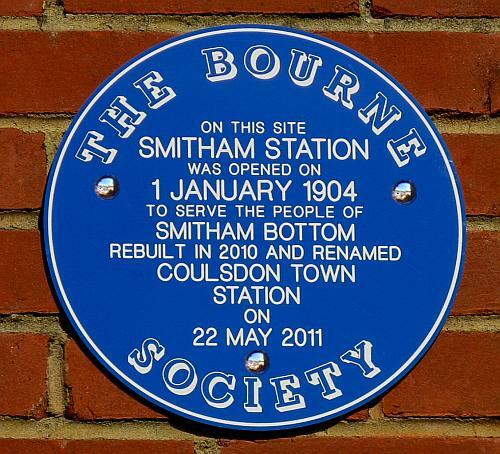 The town appears to have been renamed Coulsdon in 1910, although the station itself retained the name “Smitham” until 2011. During 2009, Smitham station had lifts installed and subsequently in 2010 the old station building was replaced with one of a new modular design. The last stage in the process was to change the name of the station to reflect that of the new refurbished town centre. Southern consulted with Croydon Council, local user groups and residents and the preferred name for the station turned out to be Coulsdon Town. Having installed the new signs for Coulsdon Town, Southern donated two of the original signs to local historical organisations; one to the East Surrey Museum at Caterham and the other to the Bourne Society. The Society has recently commissioned a Blue Plaque celebrating the change of name of the station. The plaque was mounted on a wall above the station notice board and unveiled by Councillor Steve O’Connell, GLA Member for Croydon & Sutton (2nd from left in photograph). 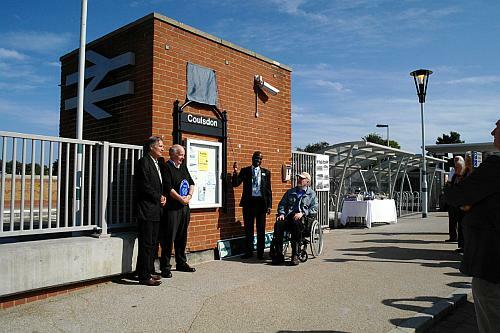 Others involved in the ceremony and shown in the photograph above (left to right) were Roger Packham, President of the Bourne Society, Southern Rail manager Nkululeko Phiri and East Surrey Transport Committee member Peter Appleford.